This is a list of all known hardware for the Wii U. The Wii U is also compatible with all Wii accessories. The sixth Nintendo home console is capable of generating high resolution HD graphics as well as featuring compatibility with all Wii games and accessories. The Wii U GamePad features a large touch screen, two analogue Control Sticks, a + Directional Pad, six face buttons, 2 shoulder buttons and 2 triggers, plus Power and Home buttons. The controller can display games on the screen, as well as providing interaction options for games. A traditional style controller that can be used with compatible packaged and downloadable Wii U games. Note that it is not backwards compatible with Wii games. 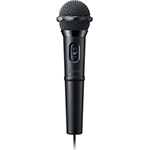 The Wii U Microphone comes packaged with SiNG Party or available separately. It allows the user to interact with compatible software using their voice. 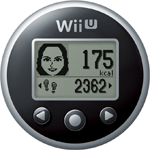 A portable pedometer that connects to Wii Fit U and other compatible titles. It measures the number of steps you take, elevation climbed, and estimated number of calories burned.